This book thoroughly examines Matthew's gospel. It discusses appropriate methods for interpretation and considers in detail the gospel's origin, purpose, and social setting. Graham Stanton claims that Matthew wrote the Gospel following a period of prolonged bitter disputes with fellow Jews. With considerable literary, catechetical, and pastoral skill the evangelist composed a gospel for a new people (both Jews and Gentiles) in a cluster of Christian communities. 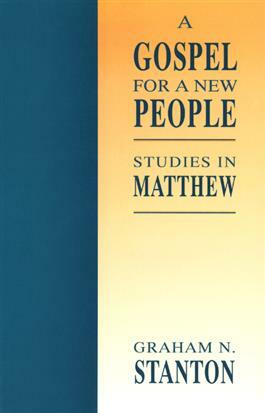 Dividing his book into three sections, Stanton discusses redaction critical, literary critical, and social scientific approaches to the interpretation of Matthew; he confirms that Matthew's Gospel was shaped by the "parting of the ways" with Judaism; and he includes two essays on the Sermon on the Mount and one on Matthew's use of the Old Testament.